With a new city comes a new name and a new coach. 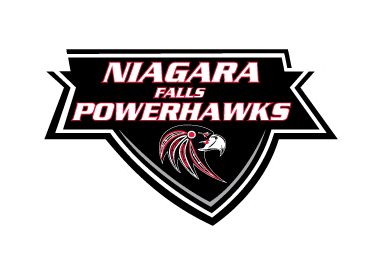 The Lockport Express will now be the Niagara Falls Powerhawks, with Jason Hill taking over coaching duties from Frank Vecchio. He was also named the Associate Director of Hockey Operations. Jason Hill joined the Express team a couple weeks after Vecchio resumed head coaching duties. The team went two games over .500 with Hill on the bench, and only missed the playoffs by a single point. He played Junior Hockey for the Welland Canadians in the GOJHL, scoring 210 points in 178 games. At the completion of his junior career, Hill committed to play at Buffalo State. During his four years there, he scored 131 points in 90 games. At Buffalo State, Hill broke the school scoring record as well as the assist record. He then signed his first professional contract with the Wheeling Nailers of the East Coast Hockey League. In his Minor Pro career, he tallied 185 points in 179 games. Hill also owns Hill’s Hockey Development in Niagara Falls. “Having Jason come in as Head Coach and Associate Director of Hockey Operations is a major coup for our program. Jason and I have known each other for a number of years and his vast knowledge of all aspects of the game and the ability to pass that on to our players is something our players will benefit greatly from. This also allows me to focus solely on my General Manager and Hockey Operations duties. I trust Jason explicitly and the future of our program has never been brighter,” said Vecchio about his new coach. End of the season honors were given to Express defenseman, Nick Grupp, as he was named to the All-NA3HL Rookie Second Team. The Niagara Falls Powerhawks will play their home games at the Hyde Park Ice Arena in Niagara Falls for the 2017-2018 NA3HL season. As the Lockport Express, they played their first three seasons in the newly constructed Cornerstone Ice Arena in downtown Lockport. Lockport previously hosted junior hockey teams in the early 1980s with the Lockport Wolves and the Lockport Marlboros. Niagara’s Watercooler will continue to cover the team after its move from Lockport.